Bill and Karen Dunlap arrive home last Thursday aboard their 36-foot sailing vessel after voyaging to Hawaii and back during their summer vacation from posts as teachers at Wrangell schools. They tell about their adventures on the homeward voyage in this article written for the Sentinel. As we sit here securely docked in the Wrangell harbor it is difficult to reflect clearly anymore upon our journey a month ago. The big seas, the leaky cupboards, the hole in the window that soaked everything in the cabin, the small electrical fire. It all seems so small and unimportant now. Our thinking was positive as we left Hanaiai Bay on Thursday July 30th (1970). We had a ship that could endure more than its crew, it was outfitted with food for 30 days and only 30 days and we had a steering vane now that would steer us to Wrangell. Out of 28 days at sea we were becalmed four days in the Pacific High. We had 90 gallons on fuel on this trip so we motored 80 miles a day, sailed 10, and sat becalmed for the rest of the days. These four days were very busy for us. We spent a lot of time chasing Japanese glass floats. The water was glassy calm so they were easy to spot. After diving in the water 12 times in one day to retrieve the glass floats we decided there had to be a better way. We devised a net from a boat hook and hammock and this proved to be very effective. Our total catch was 26 floats! We caught an abundance of tuna and bonita. This increased our food supply by one week, as we ate fish three times a day while the fishing was good. 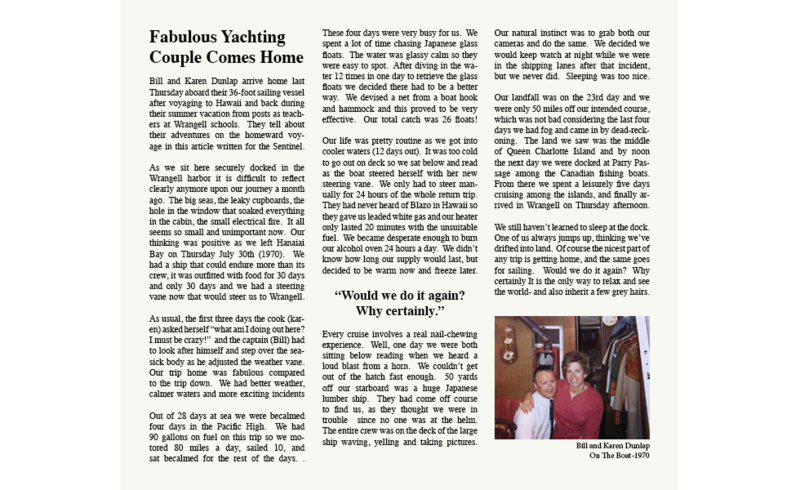 Our life was pretty routine as we got into cooler waters (12 days out). It was too cold to go out on deck so we sat below and read as the boat steered herself with her new steering vane. We only had to steer manually for 24 hours of the whole return trip. They had never heard of Blazo in Hawaii so they gave us leaded white gas and our heater only lasted 20 minutes with the unsuitable fuel. We became desperate enough to burn our alcohol oven 24 hours a day. We didn't know how long our supply would last, but decided to be warm now and freeze later. Every cruise involves a real nail-chewing experience. Well, one day we were both sitting below reading when we heard a loud blast from a horn. We couldn't get out of the hatch fast enough. 50 yards off our starboard was a huge Japanese lumber ship. They had come off course to find us, as they thought we were in trouble since no one was at the helm. The entire crew was on the deck of the large ship waving, yelling and taking pictures. Our natural instinct was to grab both our cameras and do the same. We decided we would keep watch at night while we were in the shipping lanes after that incident, but we never did. Sleeping was too nice. Our landfall was on the 23rd day and we were only 50 miles off our intended course, which was not bad considering the last four days we had fog and came in by dead-reckoning. The land we saw was the middle of Queen Charlotte Island and by noon the next day we were docked at Parry Passage among the Canadian fishing boats. From there we spent a leisurely five days cruising among the islands, and finally arrived in Wrangell on Thursday afternoon. We still haven't learned to sleep at the dock. One of us always jumps up, thinking we've drifted into land. Of course the nicest part of any trip is getting home, and the same goes for sailing. Would we do it again? Why certainly. It is the only way to relax and see the world- and also inherit a few grey hairs.